Delhi Police Recruitment 2018 - Below are various recruitment notifications published by Delhi Police / www.delhipolice.nic.in. 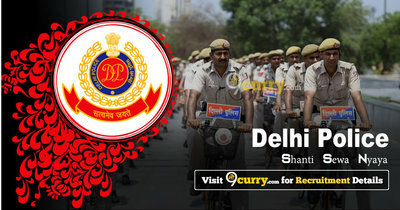 As of now, we don't have any active recruitment notification by Delhi Police featured here. We may update as soon as the organization announces a new job notification. If you are looking for any information related to previously organized recruitment drives by Delhi Police, you can browse through previous job notifications mentioned below and get the new updates or information you are looking for. Delhi Police Recruitment 2018 - Job notification for Asstt. Commissioner of Police (Senior Research Officer) Post in Delhi Police, New Delhi on Deputation Basis. Applications are invited by Delhi Police on or before 25 Jun 2018 for 1 vacancy. Delhi Police 707 MTS Civilian Recruitment 2018 - Job notification for 707 Multi-Tasking Staff (Civilian) Group 'C', Non-gazetted, Non-Ministerial in various trades like Cook, Water Carrier, Safai Karamchari, Mali, Mochi, Tailor, Daftri, Barber & Carpenter in Delhi Police on Direct Recruitment. Online Applications are invited by Delhi Police from 17 Dec 2018 to 16 Jan 2018 till 5 PM for 707 vacancies.